I've been trying to incorporate more salmon into my week-night dinners. Though this high-fat flavorful fish is delicious on it's own I like to switch things up periodically. Browsing the internet I found the recipe below on Food & Wine and couldn't be happier with the results. Though you may be tempted to skip the salad, I suggest thinking twice. 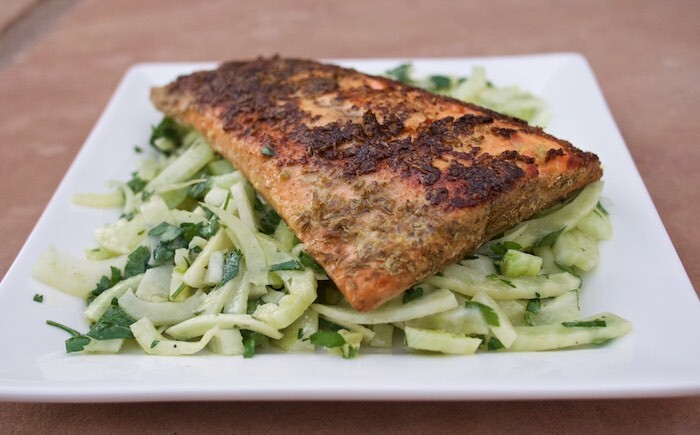 The spice rubbed salmon and the cooling, crunchy fennel salad are a match made in heaven...and the combo should not be missed.